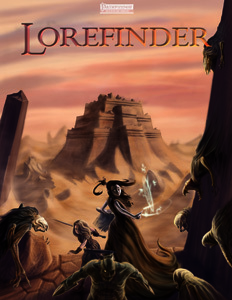 Pelgrane Press has announced the upcoming release of Lorefinder, a Gumshoe supplement for the Pathfinder RPG. For those not familiar, Gumshoe is an RPG focused on investigation. What this book will do is take the Gumshoe investigation approach and apply it to the Pathfinder fantasy roleplaying system—a winning move in my opinion. I was very impressed when I first read Gumshoe, and I’ve often applied its methods to investigation scenarios in other games.